Marchex is one of the leading mobile advertising analytics companies, and it allows you to connect your audience’s online and offline behaviours. With a Marchex dashboard, you can gather your customer phone call data, along with your online analytics data, all in one place! Create your Marchex dashboard today! Whether your own or your client’s logo, make your dashboard reflect your brand! Drag-and-drop your widgets onto your report to create a clean dashboard layout that includes all the information you need. This historic widget shows the total number of calls you received. This list widget shows your calls by campaign, in order of total number of received calls. This list widget shows your calls by group, in order of total number of received calls. Want to see all our Marchex preset widgets? 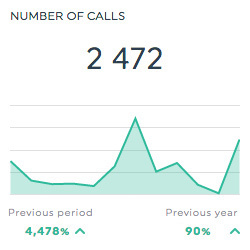 This shows you the average call duration, which is calculated by dividing the total call duration by the number of calls. This shows the total number of received calls. This dimension allows you to isolate your data based on the ad group. This dimension allows you to isolate your data based on the call status. This dimension allows you to isolate your data based on the caller. This dimension allows you to isolate your data based on the campaign. Want to see all our Marchex metrics, segments & dimensions? Can I create a dashboard using Marchex?